Homewood lost nine seniors from last year’s state championship team. 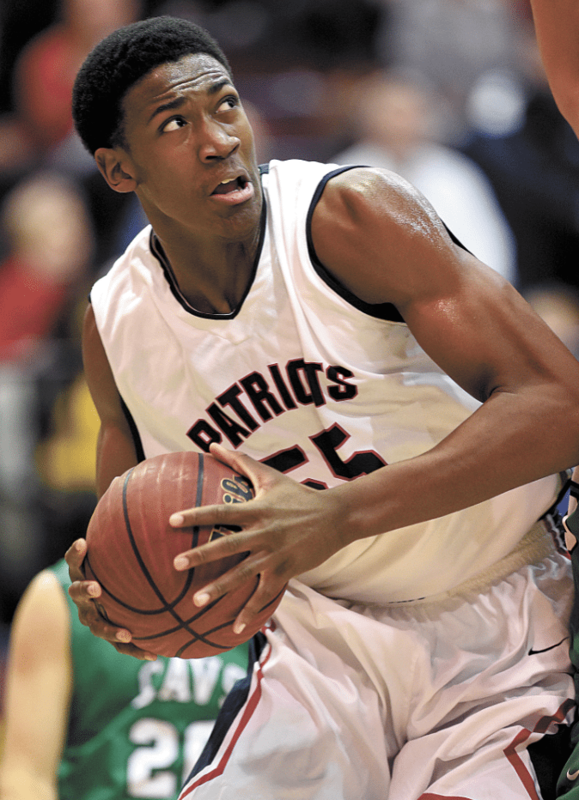 A key returnee for the Patriots is Trey Jemison, a 6-8 power forward. Journal photo by Mark Almond. To Homewood basketball fans, 2015-16 will be remembered as the season that the Patriot boys basketball team finally brought home the big prize. After years of coming close, Homewood at last grabbed the big blue trophy, winning a thriller against Muscle Shoals in the Class 6A final. The final record of 30-6 reflected the dominance the Patriots enjoyed through most of that memorable season. As the new season opened, Homewood’s hopes for a similar run rely heavily on how a host of younger players respond to the challenge, according to Patriot coach Tim Shepler. Despite an early 4-2 record, Shepler has seen plenty of positive signs. The two losses were to perennial Class 7A powers Hoover and Spain Park, and each came by one point. Perhaps Homewood’s most impressive performance of the season came in a 58-37 win over Vestavia Hills, as Luke Touliatos scored 20 points and Trey Jemison added 19. Touliatos, a senior, will be a key to the Patriots hopes for another Final Four appearance. He was the MVP of last season’s state championship final and was named Over the Mountain Boy Athlete of the Year. Even more significantly, Touliatos was at his best when the stakes were highest. He scored 31 points in Homewood’s 64-51 win over Huffman in the Class 6A semi-finals. He crushed the Vikings’ hopes for a comeback by scoring 11 points in the game’s last two minutes. For the year, he scored 15 points a game with three rebounds and two assists. Shepler sees a slightly different role for Touliatos this season. Another key returnee is Jemison, a 6-8 power forward. Despite the team’s overall youth, Shepler is willing to put his team through a grueling December schedule. Homewood will play in the KSA Tournament in Orlando and the Steel City and Metro Tournaments in Birmingham before the end of the year. The Patriots are probably aligned in one of their classification’s most difficult areas. Homewood is joined by basketball powers Parker, Shades Valley and Ramsay in Class 6A’s Area 10. “Night in and night out, you won’t find a better league in 6A,” Shepler said. Another priority for Shepler is establishing a defensive identity for his new team. Shepler has said that sometimes it’s hard to teach the importance of playing quality defense to teenage boys in an era when spectacular slam-dunks and three-point baskets dominate air time on ESPN’s SportsCenter. Over the years, simple concepts of basketball fundamentals have served Shepler and Homewood well. This season should be no exception.